Entry No. 428, Columnea 'Broget Stavanger', exhibited by Olive Ma Robinson. Score: 99. First Place. Entry No. 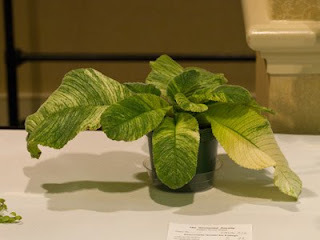 312, Streptocarpus candidus 'Wahroonga', exhibited by Paul Kroll. Score: 94. Second Place. Entry No. 513, Columnea 'Broget Stavanger', exhibited by Kristina Schmid. Score: 86. Third Place.